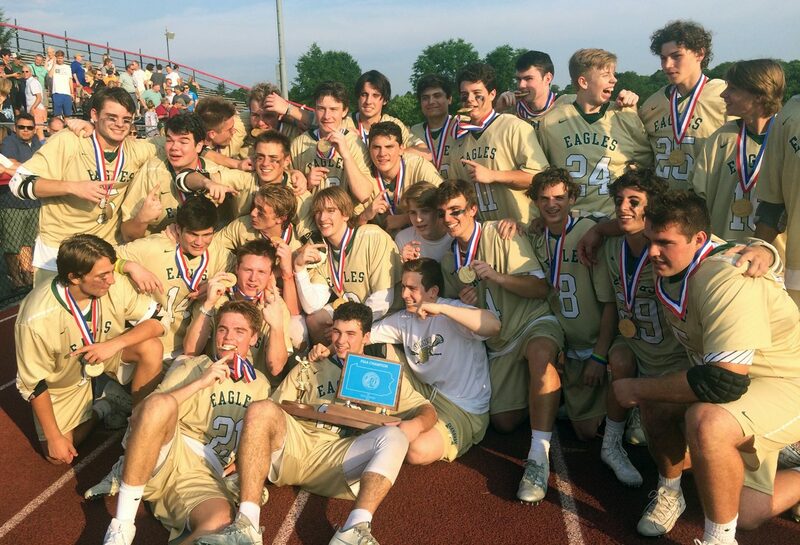 The Bishop Shanahan lacrosse team made history this season by clinching its first-ever PIAA Class 2A title on Saturday, June 9 with a 13-5 rout of Strath Haven at West Chester East High School. It did not matter how Shanahan (22-1) started but how it finished in the championship game. The Eagles did not score a single goal in the first quarter but they got down to business and poured it on strong. This marked the second game between Shanahan and Strath Haven in less than three weeks as the two teams faced off in the District One semifinals. In a similar way, Shanahan had been trailing in that match as well. This time they proved that overcoming a deficit is no problem at all. Trailing by a score of 4-0 after the first quarter, Bishop Shanahan started to turn things around. Bathon put his team on the board and went on a 2-0 sprint. Goforth cut the score to 4-3. Senior attack Connor Heisman tied the game with 6:05 remaining in the first half and the Eagles were down, 5-4, at halftime. 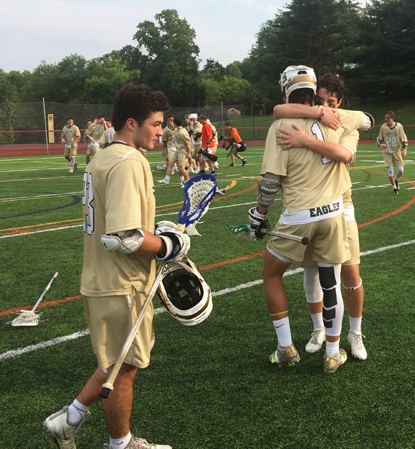 As time expires, the Bishop Shanahan players begin celebrating their championship lacrosse win. Shanahan dominated on offense and defense throughout the second half. The Eagles took a time out early in the third quarter and senior midfielder Andrew Smith found the net to make it 5-5. A goal by Goforth gave his team what turned out to be a permanent lead. Senior defender Thomas Ford extended it to 7-5 with 44.6 seconds left in the quarter. The game, and the scoring, was far from over. The Eagles continued to fly high during the fourth quarter when junior attack Bryan Rafferty tallied a goal and Shanahan used a time out. It was the right thing to do at an opportune time and it paved the way for the rest of the action. Rafferty extended his run with a second goal after the time out. Junior attack Ken Gucwa, Heisman and Goforth all contributed goals in the final moments, and then it was time to celebrate the victory and take home the championship trophy. Shanahan goalie Nicholas Perzone also contributed to the victory by stopping six shots. The Bishop Shanahan defense takes on an attack by Strath Haven in the PIAA Class 2 A championship.